ThisIsMyFile is a free portable program for devices running Microsoft's Windows operating system that allows you to delete or unlock locked files or folders. Locked files or folders is a issue that you may encounter from time to time when you are working on a Windows device. This may happen when you try to delete files, move them, rename them, or perform other operations that change the file's state or content in a way. The explanation why a file or folder is locked may be obvious, for instance when it is visibly in use by a program on the system, or not obvious at all, if it is not locked by another process. 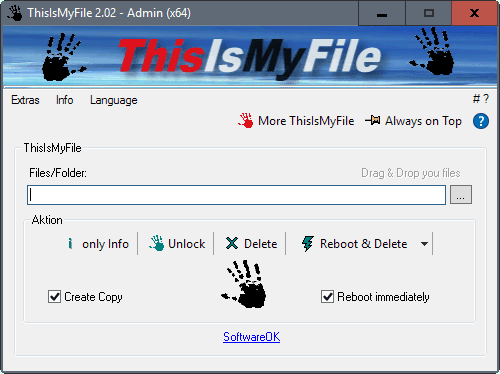 ThisIsMyFile has been designed to deal with locked files or folders. The program may be used to find out why a file or folder is locked, and also to unlock it, or run delete operations. The main interface is simple but effective. You can drag and drop files or folders on the application window, or use the browse button instead to select the data using a file browser. What happens next depends on your intention. A click on the "only info" button checks why the selected file or folder is locked. ThisIsMyfile displays its findings in a prompt after a quick check. It may list a process for instance that keeps the file or folder locked. Also, it may display options to deal with the issue right away, for instance by killing the application that keeps the file or folder locked. The unlock button does exactly the same thing, but directly and without the information why the file or folder was locked in first place. The three remaining options are all about deletion of files or folders. Delete tries to remove the selected file or folder right away, while reboot & delete, and reboot & delete without query, do so by rebooting the system. The latter two options may be necessary at times if ThisIsMyFile cannot unlock or delete the data right away. The program has a couple of additional options of which two are selected by default. Reboot immediately means that selection of one of the two reboot actions will reboot the system right away. Create copy on the other hand creates a copy of the file before delete actions. Lastly, you may set the program window to be always on top. This can be useful if you need to use the program regularly, or for an extended period of time during a session. ThisIsMyFile works similarly to other programs of its kind, be it IOBit's Unlocker, the grandaddy Unlocker, or Free File Unlocker. The program is portable however, so that you won't run into any adware or installation issues. It is furthermore offered as a 32-bit and 64-bit version. Now You: How do you deal with locked files or folders? Always used IOBit’s Unlocker till i found InstallTakeOwnership,not the biggest fan of IOBit products and found tInstallTakeOwnership does a much better job when IOBit failed,will check this out. In there, Nvidia sees fit to store installers dating back many versions, so that each time you update drivers, it leaves ALL the old copies regardless. You can’t remove them because the installer is in the above system folder. To answer my own question, I’m happy to say, yes it can delete those files/folders. This app worked great in getting rid of Nvidia bloat that until now I’ve been unable to remove. Thanks Martin! This is great. I stopped installing Unlocker when it started including the adware. I will give this a try. Thanks! I use Unlocker. I don’t have any problems with it. It solves my problems. I use take ownership. How to geek has this. For Vista, 7, 8, 8.1, and 10. Takeownership dose not work sometimes, Unlocker is still my go to for most things lock related. Also use both mentioned -TakeO & Unlocker. A few times Windows Update blew away Takeownership from the right menu selection & the file too. Learned to keep backup on D: internal HD. Lately tho it has remained. If this new one works all the better. Unlocker sometimes can’t get rid of a virus/malware kind of one but will offer to do a reboot deletion. Very very rarely fails, using older version v 1.92 so no ads. Thanks for mentioning this one.